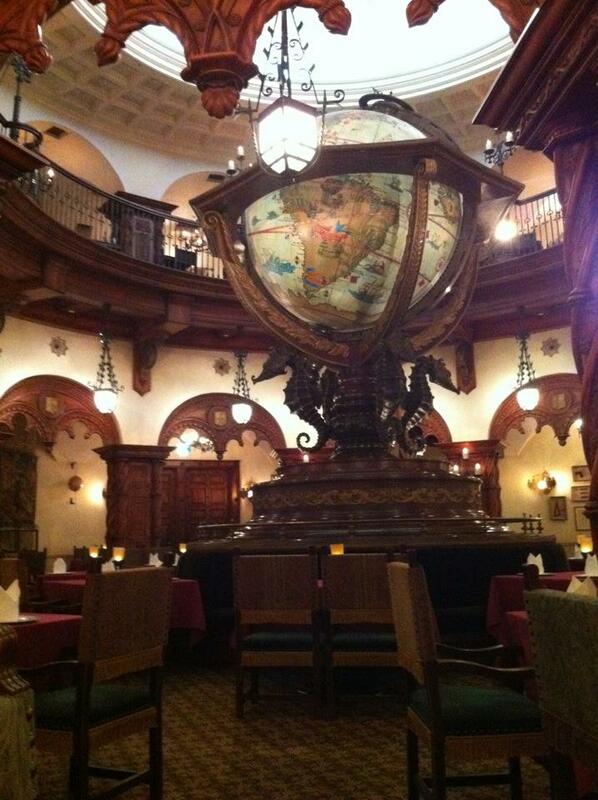 Along with the SS Columbia Dining Room, Magellan’s is one of the fanciest restaurants at Tokyo Disneysea. A Disney story about Columbus, Magellan and the S.E.A. (Society of Explorers and Adventurers) sets the scene for the restaurant which is located within the Fortress Explorations attraction in the Mediterranean Harbor. The seemingly unlikely relationship between the terms ‘fine dining’ and ‘theme park’ makes total sense once you visit Magellan’s restaurant. And if you’d rather a drink or an appetiser than a full three course meal, you can visit Magellan’s Lounge, located in the upstairs area. The Mediterranean Harbor at Disneysea is huge. 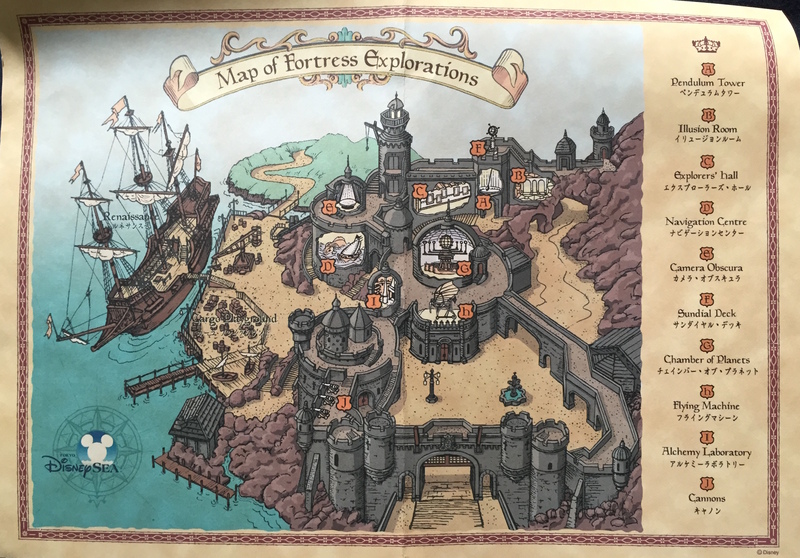 If you’ve just walked into Disneysea and you’re facing the water, Fortress Explorations is out to the right. 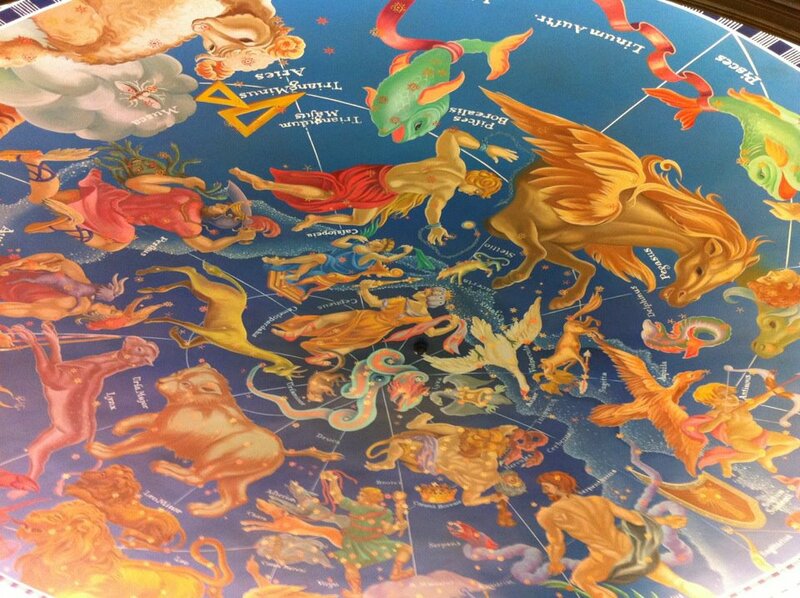 It’s an impressive attraction and I would recommend having a wander through it to gain an understanding of the S.E.A. story before going into the restaurant. Why? Because the restaurant incorporates aspects of this story, with the huge rotating globe, the S.E.A. crest carved into the woodwork, and other nice touches. 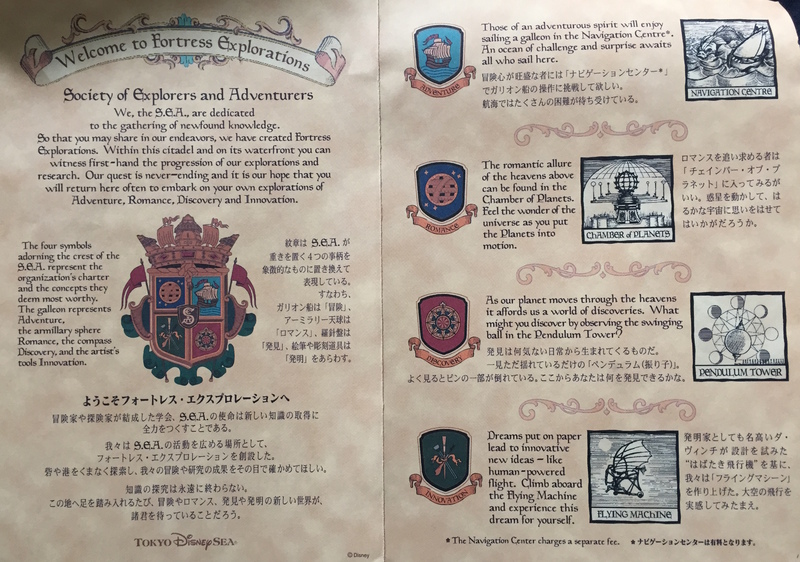 Disneysea has clearly put a lot of thought into it, and it’s worth taking some time to appreciate it. Magellan’s is just under ‘h’ on this map (the Flying Machine is above it), just near the fountain with the fish sculpture. 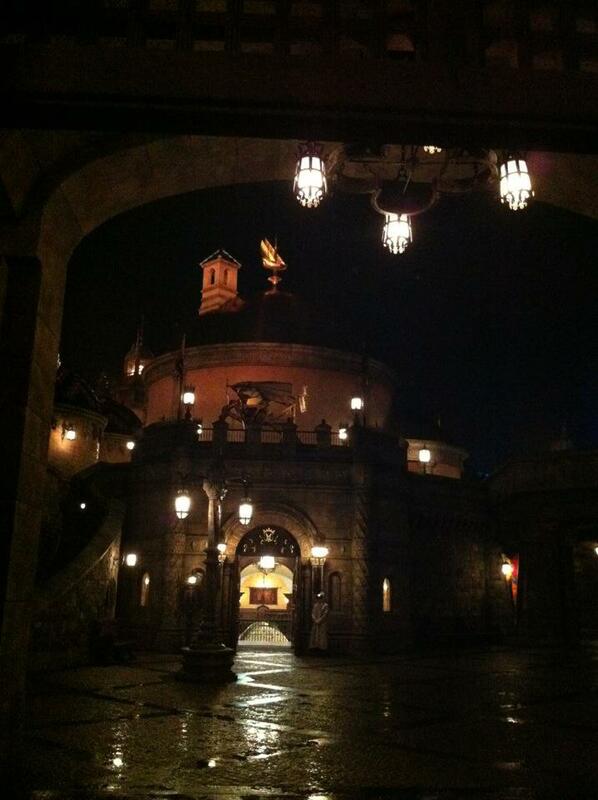 We discovered Magellan’s by accident on a rainy night during our first trip to Disneysea. We were a little soggy from the rain, not to mention cold and hungry, so we decided to take shelter in the restaurant. 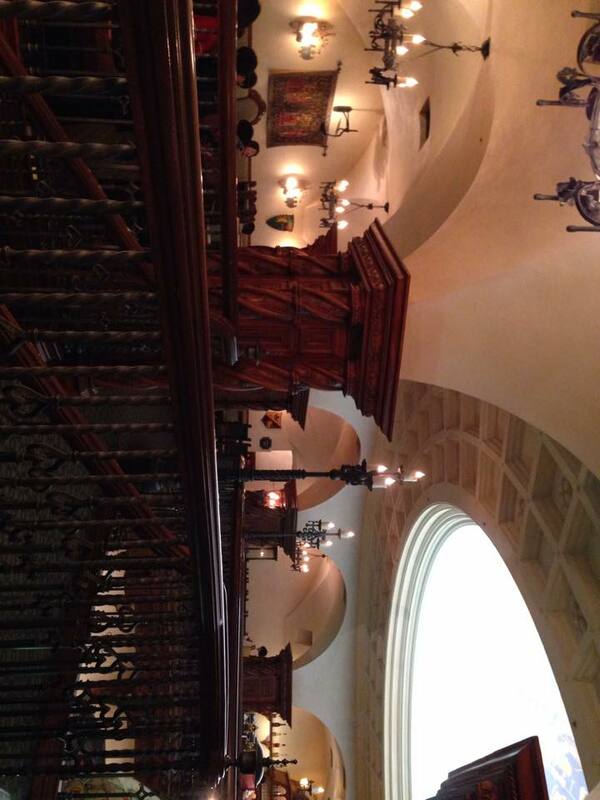 Little did we know we were walking into one of the fanciest restaurants at TDR! 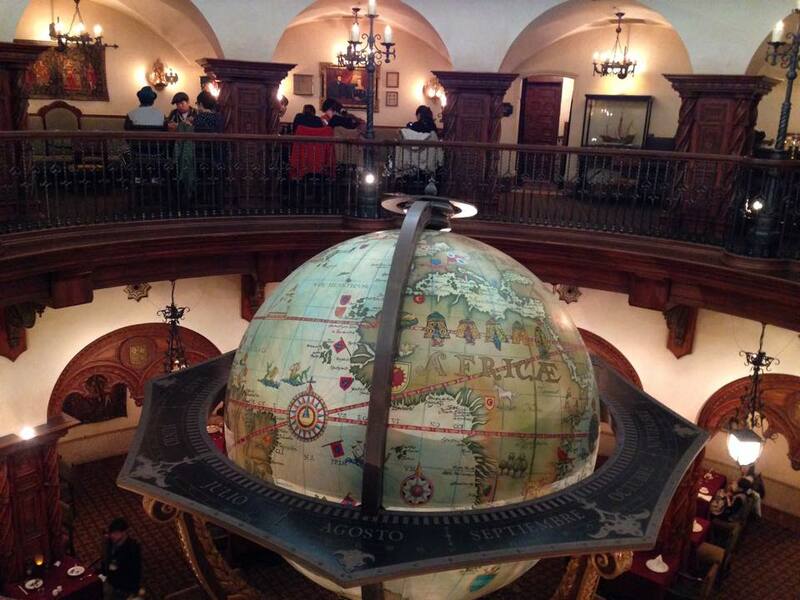 From the mural in the dome on the ceiling, to the huge rotating globe, to the intricate woodwork, there is so much to take in and appreciate when you visit Magellan’s. 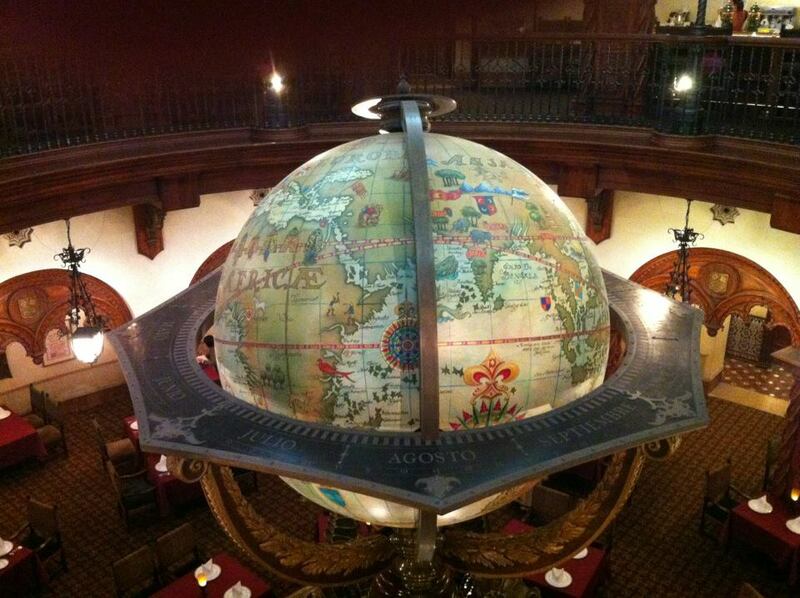 Downstairs in the restaurant, tables are arranged to take advantage of the view of the globe. Cast members wear Medieval inspired uniforms. Note the S.E.A. crest in the carved wooden archway. Chairs chairs made of carved wood and iron chandeliers give the restaurant a Medieval feel, while paintings and tapestries on the wall help to set the scene. 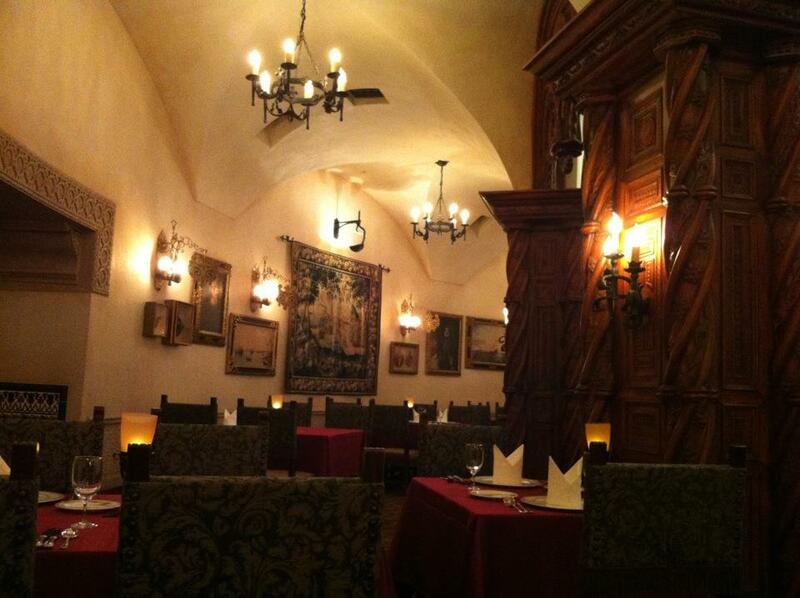 In addition to the main part of the restaurant, there is another dining room out the back, and a ‘secret’ cellar with just a few tables, hidden behind a book case. 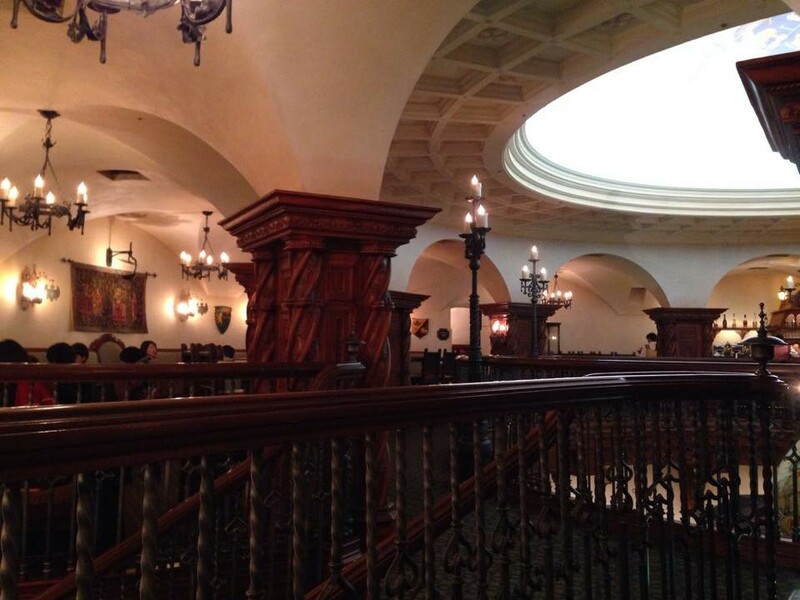 If you want to eat in one of these rooms, just ask the cast members. If tables are available, they’ll let you eat there. If you visit the restrooms here, you’ll notice that even the doors have been made in keeping with the theme. 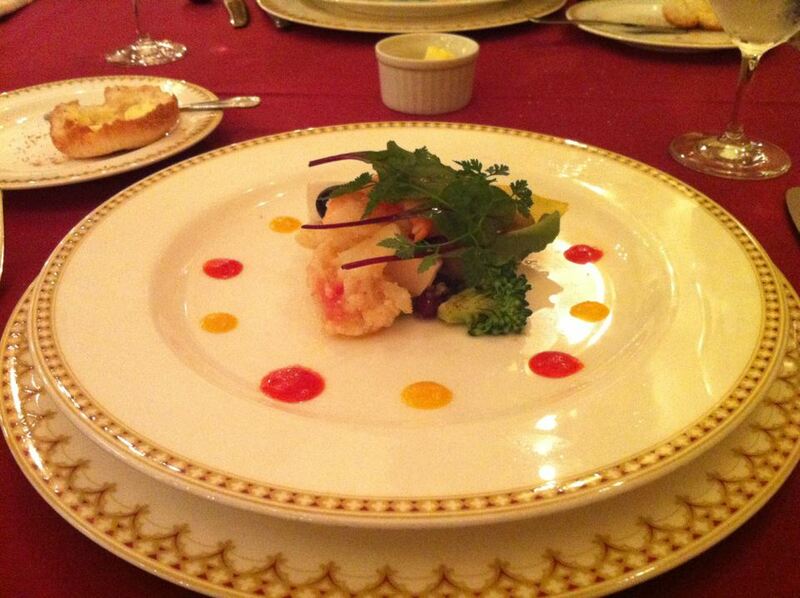 When we visited, we chose a three-course set menu. I’m not sure whether they still have this particular menu, but either way it’s a good example of what you might eat there. We started off with onion soup. 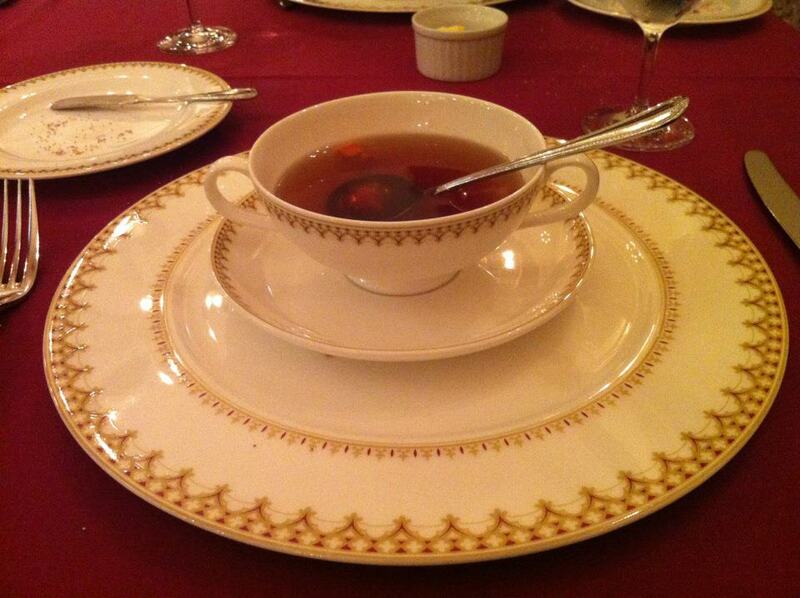 Look at that matching plate set! So much effort has been put into the design of the restaurant, and despite our casual clothes and wet hair from the rain, we felt like royalty. Next up we enjoyed and entree of prawns and scallops. 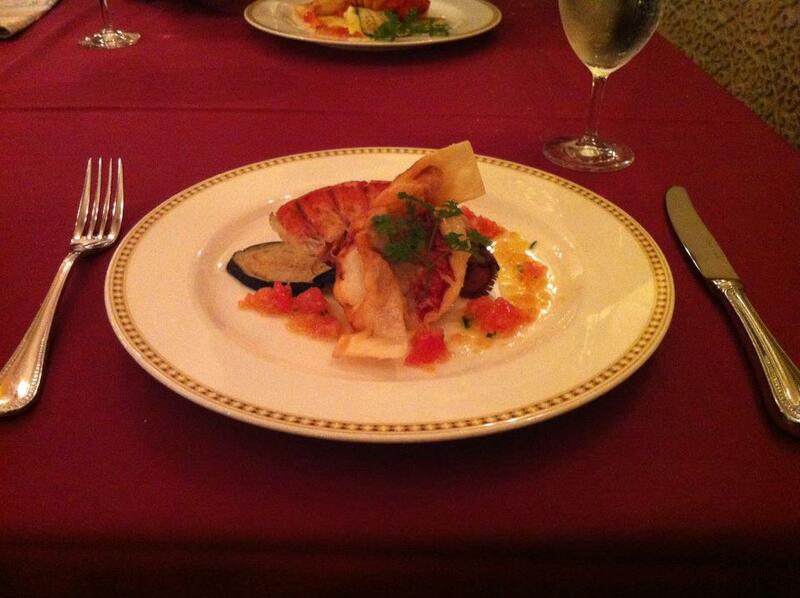 The main course was lobster, and it was delicious. Everything we ate was fantastic. 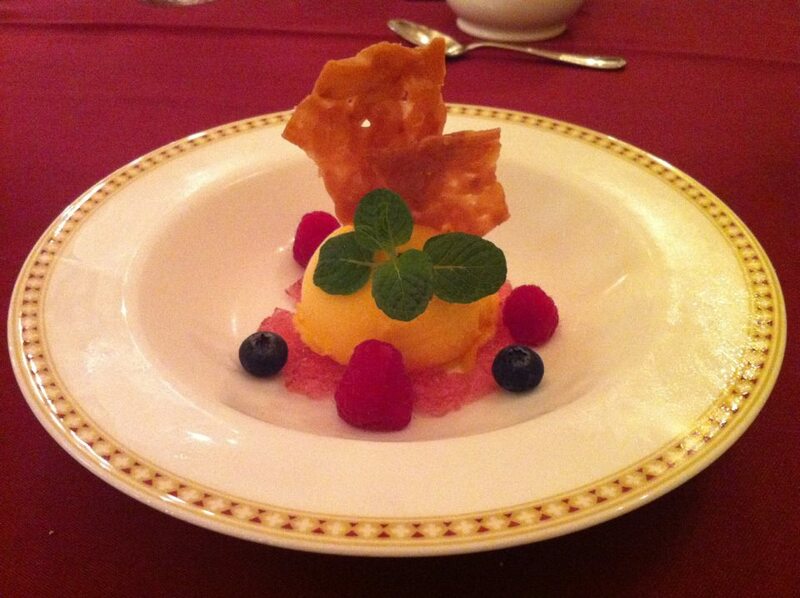 Dessert was mango sorbet with sherbet. All of the servings were small, but they were great. Like many swanky restaurants, the ‘less is more’ principle applies with the food. 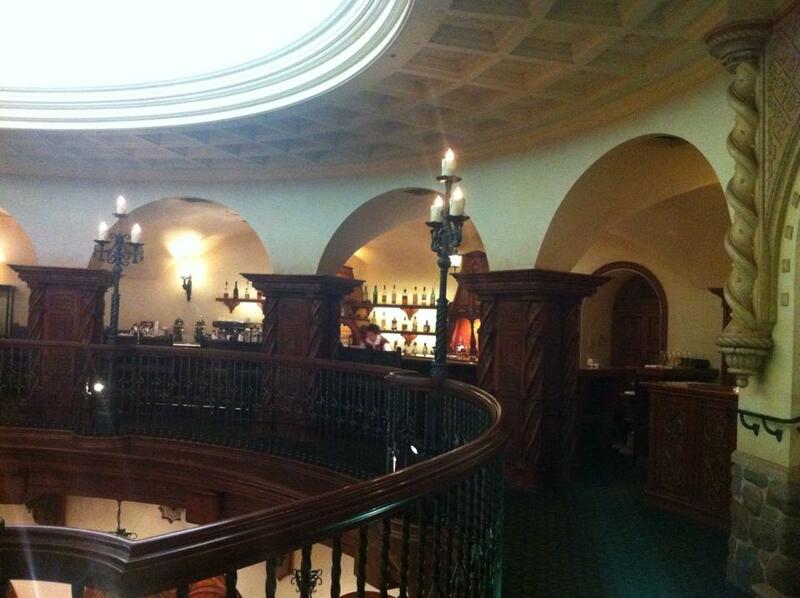 While Magellan’s restaurant takes up the downstairs area, upstairs on the mezzanine is Magellan’s Lounge. This is where you go if you want to take in the beautiful decor without eating a full meal. 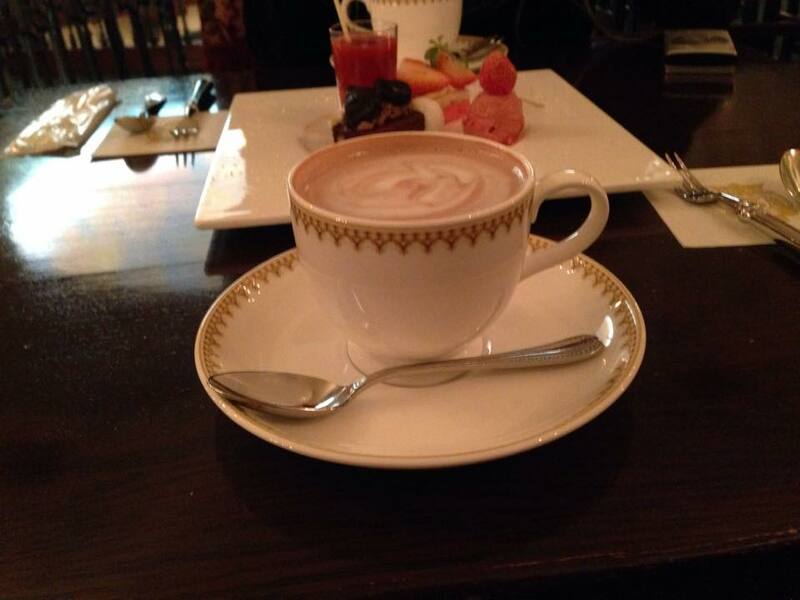 Magellan’s Lounge serves drinks from tea, coffee and hot chocolate to cocktails (remember that unlike Disneyland, Disneysea serves alcoholic beverages), and smaller snacks and desserts. Cocktails are made at the bar up in Magellan’s Lounge. 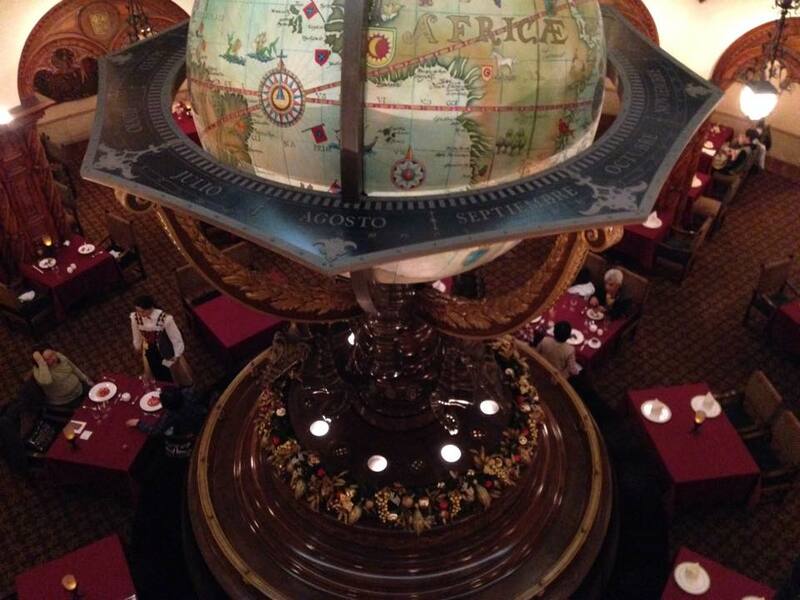 Just like the restaurant, Magellan’s Lounge is surrounded by beautiful carved woodwork, iron chandeliers, tapestries, crests and other decorations to set the scene. 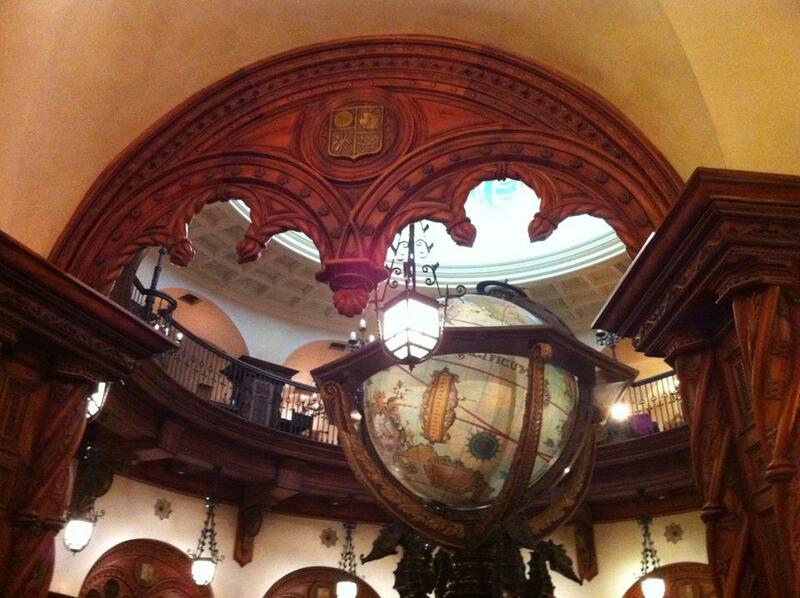 We visited Magellan’s Lounge during the recent Christmas season at TDR. It was a chilly evening so we popped in to warm up (this seems to be a running theme with our visits to Magellan’s) with hot chocolates. We also had a dessert sampler which at 1,850 Yen was very overpriced for what it was. I’ve already written about our experience and supper at Magellan’s Lounge, so click here and scroll toward the bottom of the post to read more about it. All in all, we loved Magellan’s restaurant and will definitely eat there again at some point (and hopefully I will take some better photos, as my current photos certainly do not do it justice!). We weren’t as impressed with the food or service at Magellan’s Lounge (considering the price), but it is a beautiful place and if you don’t want a meal then perhaps go there for a cocktail or a hot chocolate so you can take in the impressive decor.